Continuing their habit of bringing culinary-geography-oddities to Los Angeles cuisine, the Top Round sandwich above features Provel cheese, a processed cheddar/swiss/provolone cheese that’s particularly popular in St. Louis. 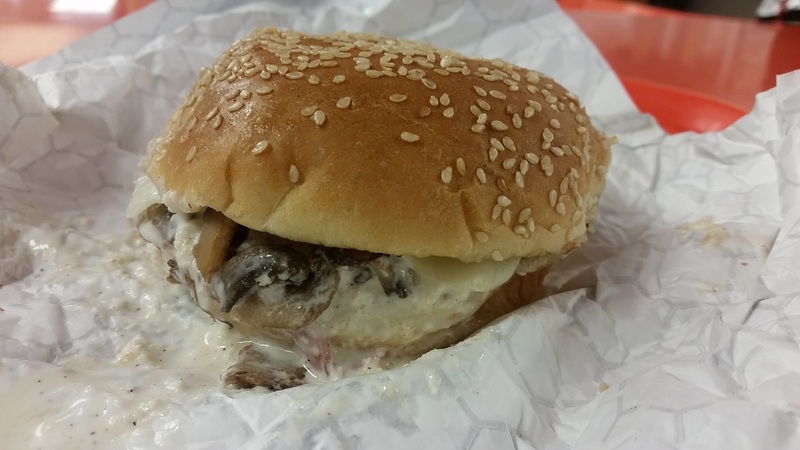 It has a loose, gooey texture and here it joins horseradish cream, roasted mushrooms and the namesake roast beef. That’s a fine lineup that works for all of the obvious reasons; it has a deep, rich flavor balanced by earthy, savory mushrooms and spicy horseradish. 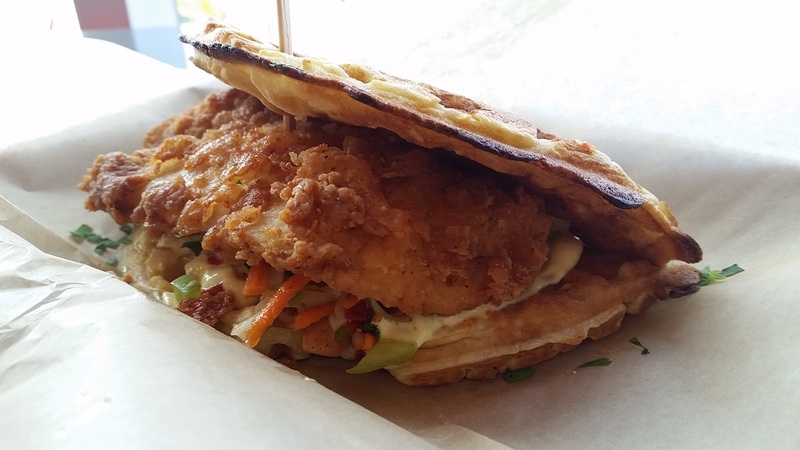 But more than a simple, well-designed sandwich, I’d like to point out a bit of execution here. Eleven. I have featured 11 sandwiches on this blog that I said needed more horseradish. There were another half-dozen or so that I ate but never featured here. “Needs more horseradish,” I said again and again, and I had basically resigned myself to this being the case for every horseradish-containing sandwich I ever expected to be served. But the above sandwich changed that. It had a proper amount of horseradish, with a fine heat throughout the sandwich and a few bites that really took it to the palate. Horseradish is an assertive ingredient, but included halfway it only serves to tease. Some of the sandwiches at Top Round fall prey to this trap, but thankfully not the one with “horse” in the name. The Horse & Hole is a fine sandwich with plenty of horseradish, and I couldn’t be more delighted to pay such a rare compliment. The last time I had a porchetta sandwich it was the high-wire act of nothing but meat and bread. 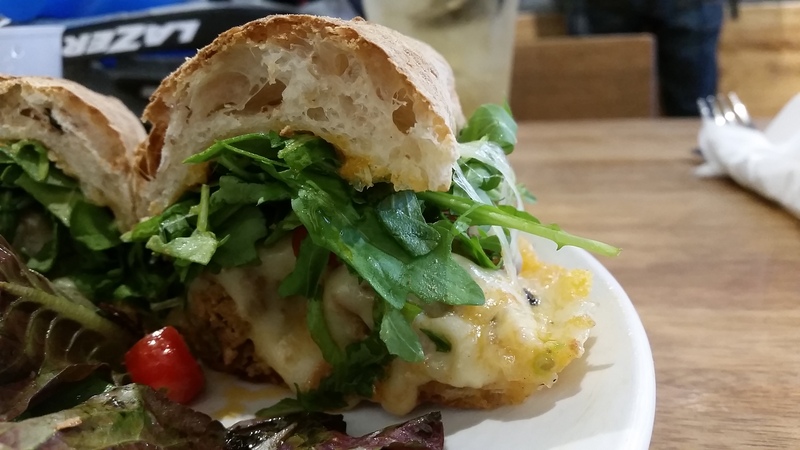 Not so at Gjelina, where the porchetta joins rosemary, fennel, garlic, salsa verde, and arugula on a bialy. I’ll cut to the quick here: this was fantastic. Perhaps top-10 fantastic. Bialys are rare in Los Angeles so it’s a delight not just to find one but to find a good one, with all the crunch that comes from the bagel’s non-boiled cousin. The pork is exquisitely prepared, savory, rich and crunchy. The garlic, rosmary and fennel are an aromatic, herbal delight, and the salsa verde brings enough heat to bump up the rest of the crew. This was rather modest in size and not quite so modest in price, but such things are to be expected in Los Angeles. That said, I think the size is just right. I’ve dug into some really rich sandwiches only to find myself overwhelmed less than halfway through, and I’ve come across more than one rube who thinks that if some is good than surely too much must be great. 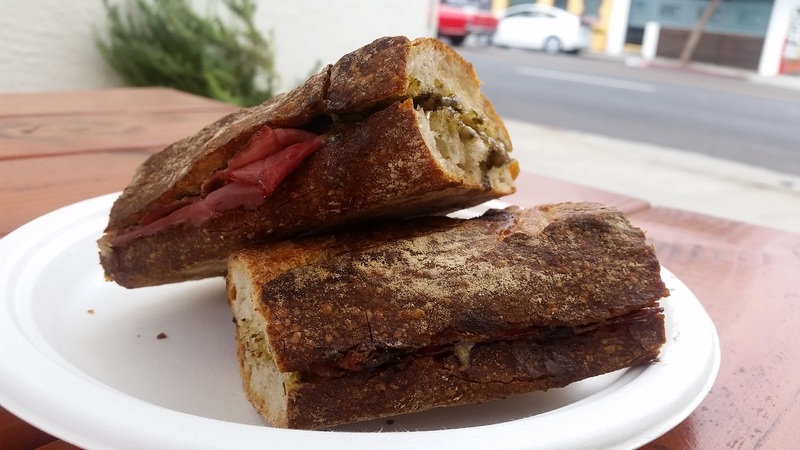 There’s a restraint at work at Gjelina and the result is a finely tuned sandwich, delicious from first bite to last. 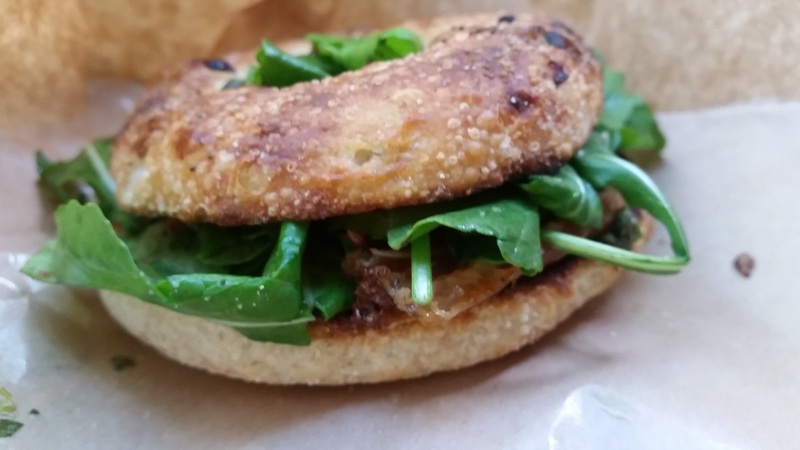 onion jam, arugula and chimichurri on ciabatta. A fine lineup.) My point here is to talk about chimichurri. In its simplest form nothing but parsley, garlic, oregano, olive oil, and vinegar it can be tweaked a thousand different ways. It’s delicious, and as I ate this sandwich I wondered why on earth we don’t see it more often. I can’t count the number of sandwiches I’ve seen that are meat, greens, and horseradish. That’s fine, I’ve loved more than a few of them, but surely we would be better off if the vibrant notes of chimichurri were not so hard to find. It can’t be logisitcs, chimichurri is something of a cousin to pesto and that’s everywhere, in grocery stores both freshly prepared and in lesser, shelf-stable forms. Simply put, I can think of no reason this sauce shouldn’t appear much more often than it does, and I salute Simple Things for working to change that. Bread Lounge is a bakery on the far side of downtown LA, and they’re serious about what they do. 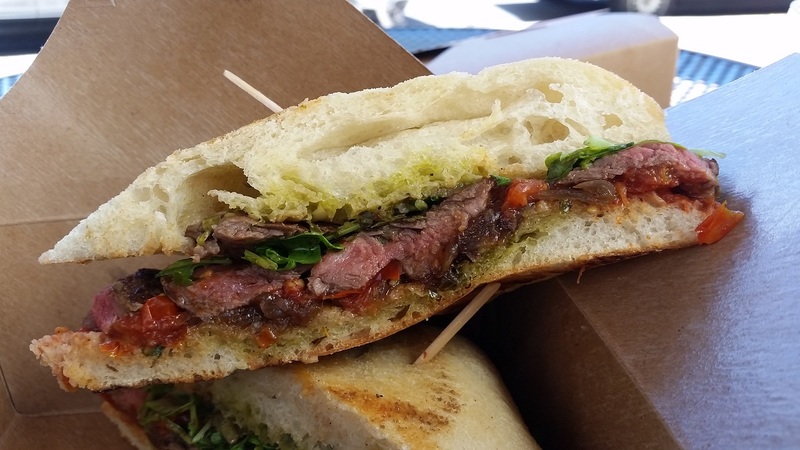 With an on-site bakery it’s hard to go wrong, and the olive loaf ciabatta the sandwich came on was outstanding. Great bread can bring a sandwich a long way, but it’s never the whole story. 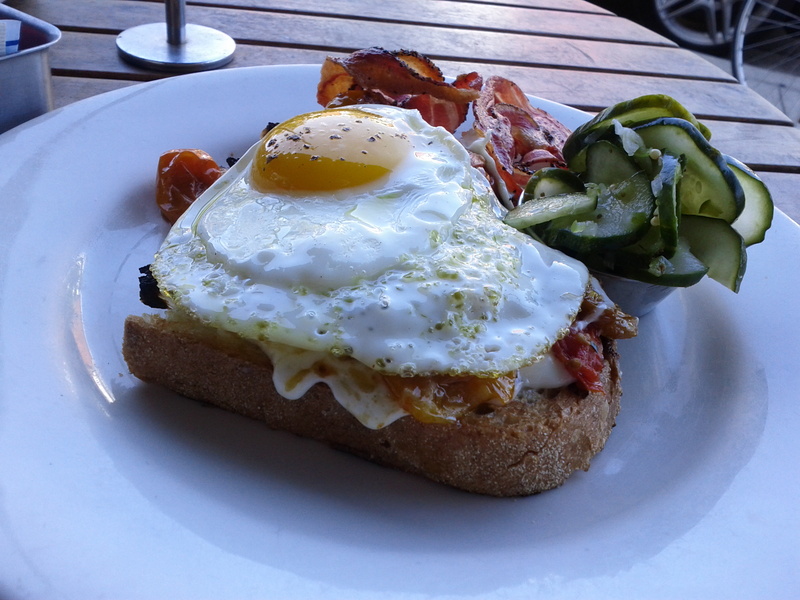 Thankfully, the sandwiches at Bread Lounge seem to have received as much attention as the bread. The Have A Ball is so named due to the starring meatballs, made from a mixture of pork and beef. They’re joined by a smoky aioli, cherry tomatoes, arugula and a healthy dose of Emmentaler cheese. A simple lineup but an effective one, as the meatballs and the cheese come together for a different take on a classic, with the Emmentaler’s contribution of a deep, rich tang an especially welcome contribution. The arugula cuts the richness with just a bit of pepper, and the aioli and the tomatoes round things out. Sandwiches at Bread Lounge come on your choice of bread, and I went with the olive loaf at the suggestion of an employee. It was delightful, and I can’t wait to try it again on one of their other offerings. 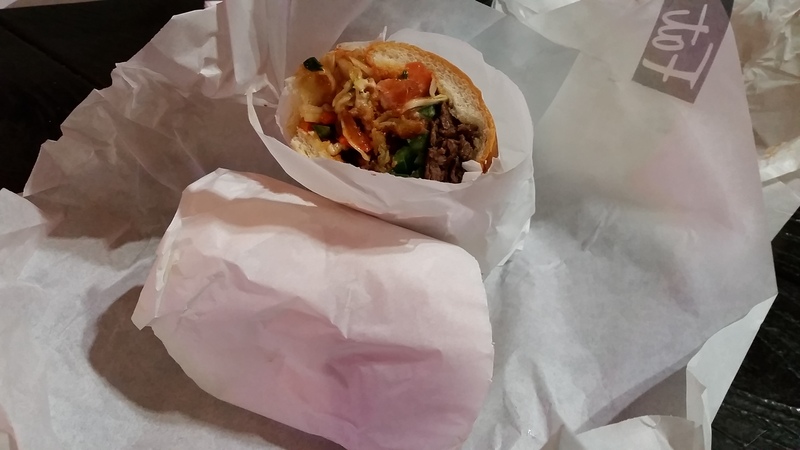 Finding a good sandwich in Las Vegas hasn’t been easy, in my experience, and a close proximity to tourist-heavy areas like Fremont Street doesn’t help. Imagine my delight upon finding Carson Kitchen, a new-American and craft cocktail enterprise the likes of which are increasingly common. 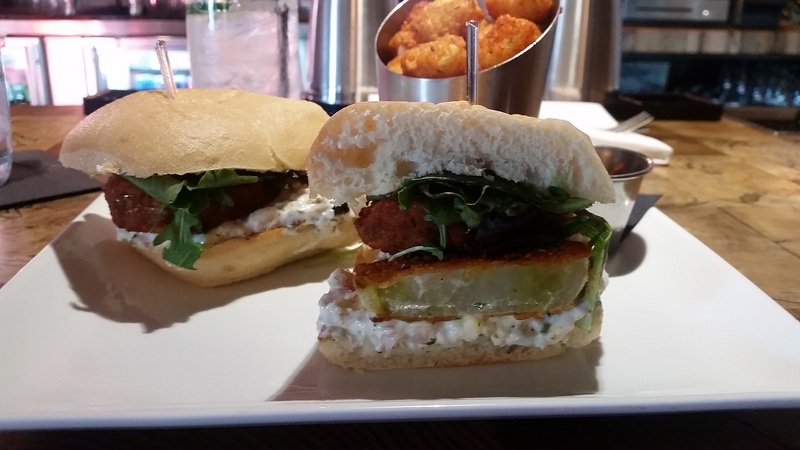 Previous fried green tomato sandwiches have left me disappointed, but the menu here was encouraging: fried green tomatoes, lump crab ravigote and baby greens. That reads to me like a well-considered effort, so I ordered the sandwich. There was no disappointment here. Ravigote is a sauce with a slight tang to it, and the addition of crab built up a rich layer that was a nice contrast. The tomatoes were well seasoned and well fried, and the greens were a delightfully bitter contrast. A good sandwich need not have a long list of ingredients, it just needs the ingredients that are present to work well together and not overpower each other. That was clearly the case here, with a bright, juicy sandwich the result. A beef on weck in Los Angeles! 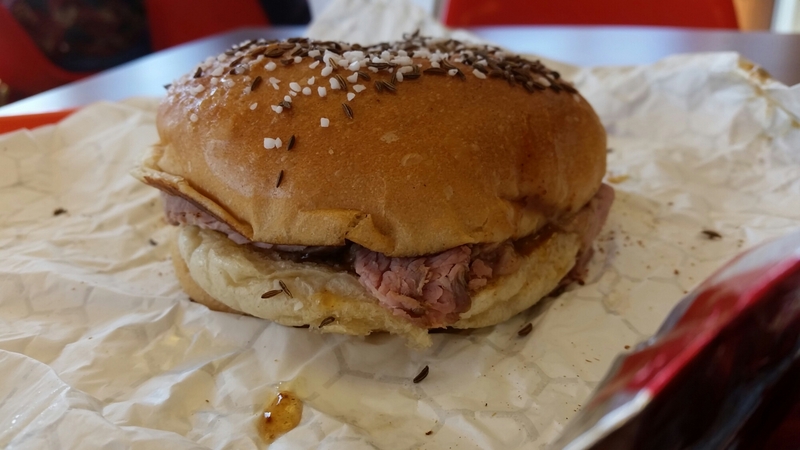 The beef on weck is a specialty of the greater Buffalo area that, sadly, hasn’t gained much traction beyond western New York. The last time I saw one was more than five years ago, at the All-Star Sandwich Bar in Cambridge, Massachusetts. I ordered it without hesitation then, and I ordered it without hesitation when I saw the menu at Top Round. In both cases I was well rewarded. I don’t know how long it will be before I see another beef on weck, but I know that when I see it I’m going to order it. I heartily recommend you do the same. Here the cheese joins sun-dried tomatoes, basil, pesto, tomatoes and roasted peppers on All About The Bread’s basic roll (which really is stellar), resulting in a bright, rich sandwich with strong vegetable flavor. I want to note specifically that it doubles down (twice, in fact) with two types of tomatoes and both fresh basil and pesto. Sandwiches being about balance and harmony as they are, doing this sort of thing certainly runs the risk of throwing the whole sandwich off, but I think it’s successful here. It certainly wasn’t overbearing, and I think it’s because neither standard tomatoes nor fresh basil are particularly assertive flavors. 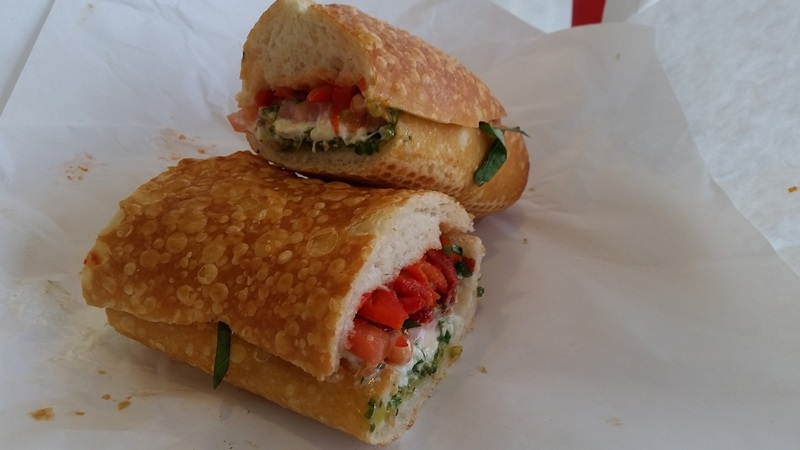 All in all, the burrata makes a fine base for a delightful sandwich.